Hey... to a kid, 8 minutes IS an everlasting song. For modern trance fans, the duo of Lemon & Einar K (formerly part of Aven) have provided an aural haven for euphoric, uplifting trance since their first release of "Hope" in 2007. Of course, for everyone else, their name means absolutely nothing. And that's a shame because most of Lemon & Einar K's work is actually pure gold; heck, if you just put a cameo by Rihanna in there, everyone would love the music to death. But alas, they didn't get a hold of Rihanna... or Li'l Wayne... or Flo Rida... or any of the famous folks that always have to wedge their voices into the latest releases in fear of being forgotten for a nanosecond. Instead, the duo have wisely selected the extremely unknown Norwegian, Paul Johannessen (isn't every Norwegian a Johannessen? ), for the role of vocalist in their first and only release of 2011. "Everlasting" comes in two flavours: Original and Dub. The Original Mix is likely the prefered track for most listeners. The song starts churning in traditional trance fashion: pounding beat, standard bass, whimsical pads. It really doesn't give any indication of a unique identity until Mr. Johannessen steps in to sing about storms and pain and such. He has a smooth voice; in fact, most male vocalists from Scandinavia are very pleasant to listen to, at least from my experience in the trance genre. Slowly but surely, the song builds up to an impressive climax (and later, another), not made impressive by the music, but by Paul's solid, effective voice. The lyrics may not do you in, but the audio will. Surprisingly, a strong instrumental melody is not at the absolute forefront for the first time in a Lemon & Einar K song, but Paul Johannessen's vocal abilities are more than an ample replacement. However, the duo still manage to keep my ears tingling with rapturous synths, as expected. All in all, a very classy trance tune that should not be simply passed over. Meanwhile, the Dub Mix is very similar in structure, though with a slightly augmented bassline to switch things up. It lacks, however, any vocals, so if you only wanted an instrumental version of the song, this is it. 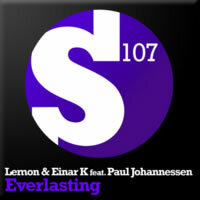 Although I admit to not having heard every single track of 2011, "Everlasting" is most assuredly one of the better trance releases of the year, boasting some amazing vocals. I'm not normally a sucker for male vocals in... well, music... but this one did me in. I'm hoping that the elusive Paul Johannessen comes back for more Norwegian vocal fury. Take a listen to this one if you can; it's definitely worth the search.